Planning to throw a few combinations and see which lands the knockout punch. There might be a bit of mix 'n' match along the way with power supplies and perhaps some Radikal dualling - the fight will be on and should soon reach its Klimax. Should have called it the Dynamik Dorset Dust Up. Interesting statistics but remember David and Goliath. Can't wait for the dust to settle. Or Is The Judges Decision Final.? Only fair to use stock mains leads and placed in the same position for comparison. Or you'll be wanting to change your Aro! So, my deck is as in the sign off above. Ray's deck: Cymbiosis LP12 Birdseye Maple Simplinth, Akurate Radikal, Kore, Khan, AO Uniarm, Tranquility, Dynavector DV20X2L, Urika/Linn Silvers. Now to be fair pretty much everything was stacked against Ray's deck. 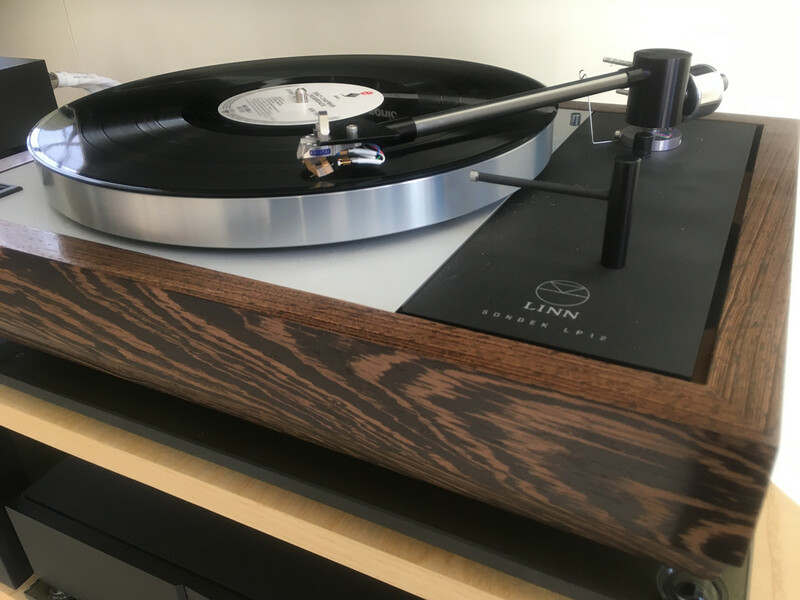 Even the Linn Silvers needed a Mayware adapter to connect to the preamp. The system had been warmed up for a while with a CD and we also warmed up the cartridges then went in with some Keb' Mo' which sounded great on Ray's deck - bouncy, joyous mellow - very smooth even laid back. I wasn't going to do a comparison straight away but listen further into the album but Ray wanted to hear the same track on my deck. BANG and WOW Well it should be better, but the difference was astonishing. Ray's deck was very very good, but sounded like - well - a very very good record player, but the LP12/Harban deck was an "in the room performance". Musically more rhythmic and flowing, but also bigger wider and more detailed - the musicians were more obviously musicians playing music. The more complex parts and musical interplay was just easier to hear and not as blurred (in comparison). No, it did not sound like Keb' Mo was actually playing live in the room - that would be silly. But that was the feeling generated. We then spent some time going through various records where the effect was entirely consistent - but please let me emphasise that the LP12/Simplinth was very good, and bearing in mind the cost difference if the LP12/Harban deck had not been significantly better then I would have been having a serious word with myself. However, this was where the fun really started. Ray chose some music and we decided to hear what the effect of changing the Akurate Radikal power cable for a Chord Sarum T power cable. We had previously tried a Naim Powerline on Ray's AkRad, and while it was better it had not given the kind of improvement that would take it into no-brainer category - and in Ray's system the Powerline gave a better improvement on his Naim NAP200. The addition of the Sarum T power cable to the Akurate Radikal was just silly - a power cable could not possibly have that effect. The music was coming out of the box - shifting very much in the direction of the LP12/Harban We then decided to add the Klimax Radikal to Ray's deck as well - and yet another step in the same direction. The KRad brought the performance right into the room. I know some people doubt the effect of changing an Akurate Radikal for a Klimax Radikal but for me the improvement was immediate and obvious - and it really is a musical performance and dynamic presentation improvement that I strongly prefer. It's like changing some very good session players for the real band. Where it sits in the hierarchy is open to debate I suppose, but this was a clear and unequivocal case of the Klimax effect working. Now to be honest I was getting a little nervous, the LP12/Simplinth/Klimax Radikal was sounding so much better now, and we were about to put the Akurate Radikal with standard lead on to the LP12/Harban. Losing the Klimax Radikal and the Chord Sarum T power cable does knock the LP12/Harban down a fair bit - the Klimax effect works in both directions. The performance of the deck obviously lost what the KRad/Chord had brought earlier, but this is where the Keel/Aro/SSA and Krystal stepped up. We were not of course comparing like with like but in this shoot out the Keel/Aro/SSA and Krystal (even held back by the AkRad) were too good for the Kore/AOUniarm/Silvers with DV20X2L bolstered by the KRad. It was the slam, the power, the detail, the musicality that won out. The clarity with the Keel platform made the difference. So, yes the LP12/Harban was better, but the gap was closed considerably. It was not the "astonishing" difference that we had earlier. This is all helpful. I think that I now have a better feel for which upgrades work when. If I had a Akurate Radikal deck with a Kore, and could upgrade to a Keel, I would still do that before changing the Radikal box, but I would definitely aim to change the Radikal box. If a Keel was not an option, then I would look at alternatives.